Synoptic circulation patterns, defined as anomalies in sea level pressure (SLP), 500 hPa geopotential height (Z500), and 250 hPa wind speed (V250) and referred to as large-scale meteorological patterns (LSMPs), are characterized using the self-organizing maps approach over southern South America. Results show a wide range of possible LSMP types over a 37-year period of study. LSMP type variability can be summarized as a spectrum from patterns dominated by positive SLP and Z500 anomalies with a poleward displacement of the strongest 250 hPa winds, to patterns dominated by similar structures but with anomalies of opposite sign. The LSMPs found are connected with lower tropospheric temperature and wind, precipitation, and the frequency of atmospheric rivers (ARs). This highlights LSMPs more closely associated with anomalous and potentially impactful surface meteorology. Results show ARs as primary drivers of heavy precipitation over some of the region and connect their occurrence to driving synoptic dynamics. Two important low frequency modes of climate variability, the Southern Annular Mode (SAM) and the El Nino Southern Oscillation (ENSO), show some influence on the frequency of LSMP type, with the SAM more directly related to LSMP type modulation than ENSO. 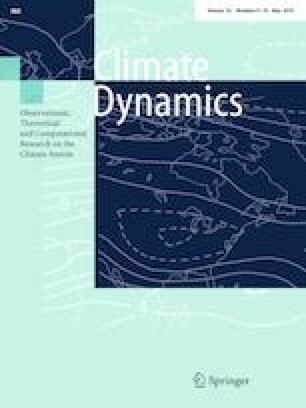 This comprehensive climatology of synoptic variability across southern South America has potential to aid in a mechanistic approach to studying climate change projections of temperature, precipitation, and AR frequency in climate models. P. L., J. D., C. R. M., and A. B. acknowledge support from the U.S. National Science Foundation AGS-1547899. E. S. acknowledges support from the NASA Indicators for the National Climate Assessment (NCA) Program. Climate indices are obtained from the U.S. National Oceanic and Atmospheric Administration via the Web at https://www.esrl.noaa.gov/psd/data/climateindices/list/. MERRA2 reanalysis is available from the U.S. National Aeronautics and Space Administration via the Web at https://gmao.gsfc.nasa.gov/reanalysis/MERRA/. ERA-Interim data are available via the Web at https://www.ecmwf.int/en/research/climate-reanalysis/era-interim. University of Delaware data are available at https://www.esrl.noaa.gov/psd/data/gridded/data.UDel_AirT_Precip.html. We thank Hans Von Storch and Silvina Solman for their helpful contribution and guidance on this work. We thank Nathaniel Johnson for providing the SOMs Matlab code.